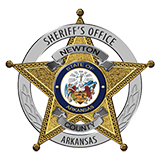 Newton County Sheriff Keith Slape asks motorist in the county to be aware of inmates working along the roads and public areas of Newton County. The Newton County Sheriff's Office participates in a program in conjunction with the Arkansas Highway and Transportation Department in which inmates are utilized to clean highway shoulders and ditches. The inmates are closely supervised by Newton County Sheriff's Office personnel. Inmates bag the roadside litter and leave it along the road for Arkansas Highway and Transportation Department workers to pick up afterward. "Instead of sitting in jail and not being productive, this allows non-violent inmates to get out and do something worthwhile for the county." Sheriff Slape said. In addition to working on highway cleanup, Newton County Sheriff's Office has used prisoners to clean up cemeteries throughout the county, help get the square and Bradley Park ready for the annual Buffalo River Elk Festival and clean up the fairgrounds for the fair. Slape added "We don't want the citizens to be alarmed when they see a group of inmates along the roadways, and we encourage them to slow down, but not stop, when they encounter the warning signs. These inmates will always be supervised by our deputies."